Extend the features and functionality of a central PBX to home-based workers with analog lines. Citel’s EXTender 1100a gives teleworkers and other single users seamless remote access to the corporate voice and data networks and associated applications. The EXTender 1100a is a smart choice for enterprises managing remote workers lacking a broadband Internet connection. Teleworkers and other remote employees are able to access PBX/KTS dial tone, receive office-bound calls, and invoke business calling features such as internal dialing, transfer, hold, and conference. Users who also maintain a workstation at the corporate office can provide callers with a single reach number, and enjoy the convenience of one voice mailbox for all messages. And the easy system maintenance frees up your IT staff’s valuable time as well. Telecommunication costs fall by up to 30 % just by administering all PBX users from a single location and platform. And with access to internal (four-digit) dialing, there are no toll charges when calling any office within the enterprise, regardless of physical location. Further, placing regular long-distance and international calls through the corporate voice system keeps all employees on a unified dialing plan. 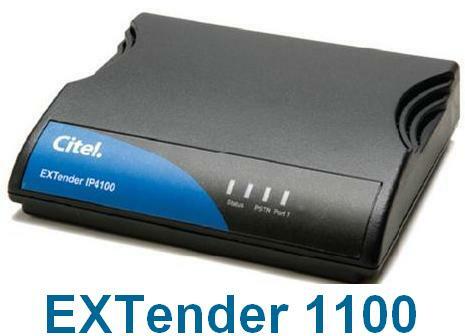 The EXTender 1100a interoperates with Definity, Magix, Norstar and Meridian PBX/KTS systems. Your enterprise can leverage its existing PBX or KTS to connect remote users to the corporate voice system. The EXTender 1100a is also an affordable, scalable solution for additional teleworkers or other single users. Additional users can be easily added with a standard EXTender 1100a configuration at the remote location, and a second EXTender 1100a or other Gateway port at the PBX. The 1100A does not support dedicated line or leased line (copper pairs) mode.